Grinding your beans is an important step in the pursuit of caffeinated nirvana, and the best way to produce the freshest coffee. Granted, you can get some very good pre-ground coffee, but as long as they're stored correctly (a largely but not totally airtight container, in a cupboard rather than the fridge) beans will last longer than pre-ground, and unleash more flavour when put through a grinder. With an unprecedented number of grind settings, stainless steel conical burr grinder and intuitive LCD control system with LED screen, the Sage Smart Grinder by Heston Blumenthal is an obvious winner here. There are three main types of grinder on the market: burr, blade and manual. Ask a barista, and they'll always choose burr, here's why. Blade Grinders (£10-£50) work just like a kitchen mixer, smashing and slicing up the beans using small, exceptionally sharp blades. While quick, cheap and compact, blade grinders don't produce the most consistent coffee grounds, while the speed of the blades can burn the beans, altering the taste. To be frank, if you tell a coffee expert you use a blade grinder, they will laugh in your face. However, maybe the joke's on them: these versatile machines may not be the best for coffee but they are great for blitzing spices for cooking. Burr grinders (£40-£400) slowly crush the beans instead of smashing them up. They offer a more uniform grind to blade models and more expensive grinders can be adjusted so you can produce a fine grind for high-pressure espresso machines, or a looser mix for filter and French Press. Look for either ceramic or stainless steel grinders, and opt for conical, rather than wheel burrs for a quieter, gentler, grind. Hand Grinders (£10-50) offer a more traditional approach, and while time consuming and laborious, the grind can be excellent. The opposite to blade grinder, if you tell a coffee expert you use a manual device, you will get double Hipster points for your person-powered, artisanal approach to a flat white. The previous Sage coffee grinder the 'Dose Control Pro' has been providing faultless bean smushing every morning for the last 5 years, round T3's way. Now its replacement, the stainless steel Smart Grinder Pro offers the same industrial quality, usability and professional results, and continues to put most domestic grinders to shame. Thanks to the large blue LCD screen you can clearly see what type of coffee you're grinding, and choose between cafetiere, filter, percolator or espresso. With no fewer than 60 grind settings, you can fine tune the results quickly and easily, something we've only seen before on more expensive pro models. Once you’ve chosen the grind, it's a simple matter of selecting the number of shots and then either accepting the calculated grind time, or adjusting it manually, to produce the perfect amount of coffee for a specific machine or method. You can also adjust the machine's presets, tailoring it for your own coffee machine or personal taste. What really sets it apart from the rest of the domestic machines is the ability to grind directly into your coffee machine's Portafilter (the handle sticking out the front with the coffee in it). To that end, it comes with two cradles, one for domestic, one for professional sized machines. This is incredibly convenient for espresso lovers and cuts down on mess. You can also use the supplied plastic airtight container, or grind direct into paper filters. And speaking of mess, the huge 450g hopper can also be removed so switching between bean varieties is mercifully simple – because it only grinds what you need you can quickly switch between decaf and regular beans without contamination - while the removable grinds catcher reduces the amount of mess on the worktop significantly. Making coffee is usually a messy business, but this provides so many solutions to that, it verges on OCD. Features mean nothing without performance, but the step-up in grind quality and consistency here is exceptional, with an espresso grind every bit as fine as a shop-bought packet. It's not cheap, but if you're serious about your coffee, it's not that expensive, and it is well worth the investment. At a quite incredible price, this monolithic design looks the business, can grind 2-12 cups worth of beans, and has a dual safety system, that cuts power if either the bean hopper or grounds container is removed during operation. Despite being all-plastic it's reassuringly robust. The minimalist design only has one niggly issue – a lack of numbers on the coarseness dial means there's an element of guesswork involved in choosing your perfect grind. That's only really a problem if you're constantly switching between espresso, filter and cafetiere, however. Most people will find a preferred setting and either leave it there forever, or make small variations to suit the age and type of bean being ground. Okay, you will find some variation in the coarseness of the grind, particularly with the finer settings, where a few larger chunks of bean can squeeze through into the collector. 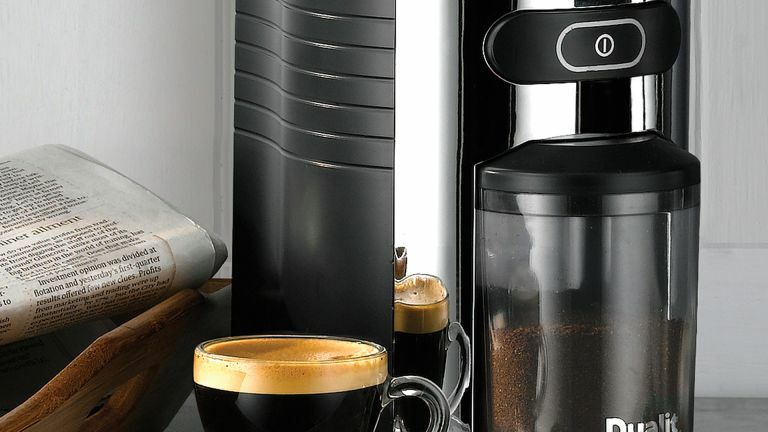 It's not a deal breaker, but as with most non-professional grinders – don’t let the product title mislead you, this is still very much a domestic machine – anyone used to only the finest of fine grounds for their espressos might occasionally be left wanting. Here, a large 250g bean hopper combined with the ability to control the amount of beans ground via a simple dial (2-10 cups) helps avoid wasting fresh coffee. It's a good deal for what it costs but if you're looking for an exceptionally fine grind for a pro-style espresso machine, you may need to stretch your budget past the 60-or-so quid this will cost you. It also suffers from a quite infuriating build-up of static around its plastic grounds collector. Given Dualit's industrial toaster heritage, we were expecting a classy metal construction, so the plastic feel was a bit of a disappointment. Even so, this is a good-looking machine, and the features and performance more than make up for it any material short-comings. So we recently got a cold brew coffee maker and were alarmed to find it required the grinding of an entire bag of beans to use it. Luckily, this KitchenAid grinder was to hand and did the job with zero fuss. That was on one of its lower grind settings, which are great for drip and cold-brew machines, and cafetieres. Dial it up and you get properly fine espresso grinds. Although the dial is numbered one to eight there are also half stops in between each of those, giving 15 grind settings in all. This suffers slightly in comparison to the similarly-priced Sage in that it doesn't have a dosing function, but it is somewhat sexier, and better for those who don't like all that hand holding. You can even take it apart and manually adjust the burrs if the presets aren't quite to your liking. Surely nobody is ever going to actually do that, but it's nice to know you could. Fill it to the brim with beans, and this stainless-steel manual grinder will produce enough coffee for around five espressos, although be warned, you'll get a sweat on producing the finest possible grind. It's slow going, but ultimately worth it, and oddly satisfying, although we'd not recommend it if you're planning on making more than a couple of cups a day. Grind coarseness can be adjusted by simply twisting the base, like a pepper mill, with an impressive 18 settings available. It's also virtually silent, if you discount the heavy breathing of the operator, while the stainless-steel handle is reassuringly solid, with virtually no give. Costing less than a week's worth of takeaway coffees, this compact twin-blade design will assuredly not win favour from 'proper' coffee lovers, who dislike the supposedly flavour-destroying heat and lack of grind control inherent in this type of grinder. Its main purpose is to produce a super-fine grind, suitable for most espresso machines, making it an ideal first upgrade for coffee bean converts. Although it can handle enough beans in one go to make 15 cups, results are noticeably more consistent if you grind fewer beans at a time, and limit it to short bursts, to avoid overheating. It's also capable of a coarser grind for cafetieres and drip machines, but you'll really have to practice for that. Also good to know: the safety lid cuts off power instantly when removed, hopefully preventing any pinkie amputations, and it is great for grinding spices. Although maybe don't use it for both that and coffee unless you take your latte curried.